A dizzyingly in-depth investigation of Martin Scorsese’s pre-Raging Bull oeuvre, The Films of Martin Scorsese 1963 – 77 searches for thematic unity starting from his earliest student shorts up to his big-budget debacle New York, New York. The egalitarian approach author Leighton Grist employs, scrutinizing films as diverse as Boxcar Bertha and Taxi Driver with the same critical intensity, may strike some readers as excessively reverent. But Grist, a British film lecturer, sustains a high level of objectivity throughout, eschewing the analysis-through-biography approach so common in literature about Scorsese for a more systematic, cerebral dissection. Casual readers beware: this is an academic book written for the serious film student. Even the most avid Scorsese fan will have trouble getting through this one. But should you decide to buy it and actually read it, you’ll find the book to be rewarding on several levels, not least of which is the belief (and subsequent proof) that each of his early movies is a by-product of both his personal experience and the cultural context under which they were made. The concept of a film auteur, or author, is foreign in today’s surfeit of impersonal blockbusters, but during the late sixties and throughout the seventies (until Heaven’s Gate), the director was king more or less. As an NYU film student, Scorsese was taught to film "what he knows" and the results were some penetrating student shorts about male rites of passage in New York’s Little Italy. One of them was expanded into his first feature, Who’s That Knocking at My Door? starring a young Harvey Keitel. The book argues that with these early student works, Scorsese already demonstrated a tendency to use film as a mode of personal expression, often at the expense of coherence. Who’s That Knocking At My Door? feels overly emblematic of Scorsese’s own upbringing; the character of J.R. (Keitel) is obviously a Scorsese stand-in. But it introduces themes Scorsese would return to again and again and it establishes a recurring motif of his career – the notion of filmmaking as a cathartic, often painful, experience that leaves the director exhausted, burned out, or washed up. Harvey Keitel and Ann Collette in Who's That Knocking at My Door? The book devotes whole chapters to each of Scorsese’s subsequent works, starting with Boxcar Bertha, an exploitation quickie he made for producer Roger Corman. Grist, ever the academic, applies the same analytic template to each movie: he starts with cursory production details and plot summary, moves quickly to a discussion of cultural context, and ends with a lengthy analysis of auteurism. His structure, though predictable, flows rather smoothly and is quite effective. For Taxi Driver, we can see how a confluence of post-Watergate social alienation, budgetary restraints, and Scorsese’s own familiarity with New York’s seedy side created an often-quoted cultural phenomenon whose aftershocks are still felt today. The chronological arrangement of chapters, however, prevents Grist from drawing many parallels. Too often his conclusions on one film stand disembodied from those of the others, so that by the end, we may understand his thesis but we’re not clear on how we got there. Perhaps Grist tries too hard to separate Scorsese from his films. His analysis doesn’t reference Scorsese’s life enough, especially for a book concerned with auteurism. He prefers dense textual deconstruction that compartmentalizes rather than integrates. Strangely, Grists’s most convincing case for auteurism is in the New York, New York chapter. The many similarities between Scorsese’s own marital woes and the those of the movie’s central couple (played by Robert DeNiro and Liza Minelli) are alarming and illuminating. Can a more obvious case of personal filmmaking be found? It’s too bad this level of biographical detail, tabloid-ish as it is, is missing in his discussions of Taxi Driver or even the female-centric Alice Doesn’t Live Here Anymore. Nonetheless, one of the book’s most surprising and salutary side effects is the de-mystification of the Scorsese mystique. Despite the critical success that gathered like a snowball, starting with the New York Film Festival premiere of Mean Streets and culminating with the Palme d’Or he won for Taxi Driver, Scorsese’s drive remains the same: he’s an auteur struggling to reflect a piece of himself on the screen. The novice who had less than a million to spend on Mean Streets is the same man who went over budget on the multi-million dollar New York, New York. For all of its intricate analyses, The Films of Martin Scorsese 1963 –77 resists the temptation to deify one of our humblest directors. 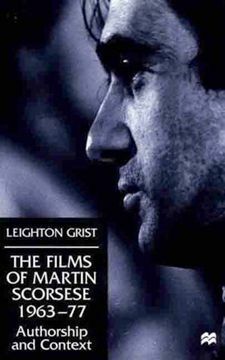 The Films of Martin Scorsese 1963-77: Authorship and Context by Leighton Grist is now available from St. Martin's Press. Hardcover. Suggested list price: $65.00.